Director John Milius’s 1984 war action film “Red Dawn” is probably one of the best guilty pleasures the eighties ever doled out for audiences. It’s certainly one of my childhood favorites, a film I recall re-watching time and time again and cheering on the likes of Charlie Sheen and Patrick Swayze. The film as a whole is absurd and incredibly silly, with everything in the film being drawn as inexplicably convenient for the good guys, and incredibly bad for the bad guys. Trained mercenaries can’t possibly outwit and outgun a bunch of high school students whose only training is hunting in the woods? Seriously? “Red Dawn” is plain and simple a silly and incredibly far fetched piece of jingoistic fiction from the Reagan era I can imagine fueled legions of Conservative gun fans to watch in repetition. The All American white bread Colorado boys, mostly of the Caucasian persuasion, use their tactics as a football team and trained hunters to fight off legions of foreigners that have taken over their land? I imagine Ted Nugent gets aroused every time he reads the plot for this film. “Red Dawn” is a tribute to violence, and a definitely goofy way of selling audiences on war by casting a slew of famous faces from the decade who litter the entire cast. The late Patrick Swayze is leader Jed Eckert who leads his little brother Matt Eckert (as played by Charlie Sheen) on a journey of survival along with a group of school friends in to the woods to fight off invading forces of Cuban and Soviet troops. 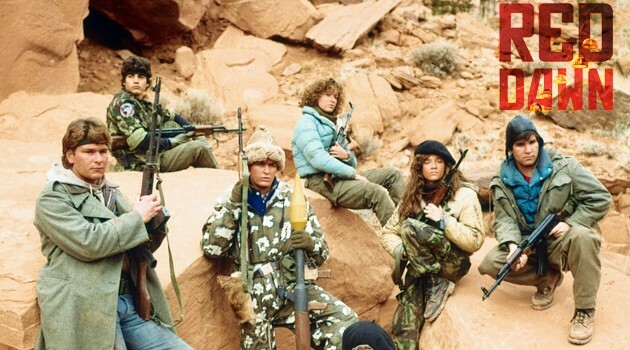 Propaganda notwithstanding, “Red Dawn” is a brutally entertaining and often times campy bit of action warfare, with the group of high schoolers seemingly becoming trained commandos overnight. Milius’ direction is still fantastic as he amps up the urgency once the troops invade. The moments of tension are subtle as the paratroopers swoop in to Colorado and begin opening fire on the local school, which causes Jed and his friends to flee for their lives, barely making it out of the line of fire. With the sweat of their brow and good old American supplies, they manage to stave off the armed forces for a long time and become freedom fighters known as The Wolverines. Over the course of the film suddenly they know how to operate fire arms, they can dig fox holes, they know how to stage elaborate strategic traps that baffle the most skilled soldiers in the Cuban-Soviet army, and they always have the proper uniforms for whatever season they’re fighting in. Even if they did somehow kill soldiers and strip them of their uniforms, what are the odds they’d be the right fit? And where did the Wolverines get so much ammo? Why were they always so clean and well groomed considering they did nothing but rough it in the woods for a few years? “Red Dawn” is certainly a silly Conservative leaning product of its decade, but one that still holds cache as a fun and exciting bit of escapism. I may not buy its message, but I never mind watching Swayze and Sheen blubber to their dad (the great Harry Dean Stanton) in the internment camp who screeches “Avenge me!” as death becomes a certainty. “Red Dawn” is a fun eighties time capsule with a great cast, a fun sense of action and adventure, and some really good moments in the genre that make it a memorable action fantasy worth re-watching. This entry was posted in Movie Reviews and tagged Action, Drama, R, The 80's, Thriller, War. Bookmark the permalink.